Purina is rolling out the red carpet for your tiny friends this year! With more than 100 years of testing nutrition for animals of all shapes and sizes, be certain that we know a furry or feathered celebrity when we see one. Your furry and feathered family members – including gerbils, hamsters, guinea pigs, rabbits, rats, mice, parakeets, cockatiels, and parrots – deserve the spotlight, so let’s allow them to shine. 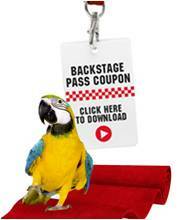 Sign up for future coupons and discounts for your small animal and pet bird buddies! Shop Lochte Feed & General Store for all your small animal feed & supplies! This entry was posted on Tuesday, March 26th, 2013 at 9:56 am	and is filed under News & Updates. You can follow any responses to this entry through the RSS 2.0 feed. Both comments and pings are currently closed.